Sometime we want to hide a post from wordpress home page. One not-so-good alternative is to create it as a page. One drawback of that approach is that it does not have tags, categories and will not come in tag/category browse pages. This article will cover how this can be achieved if there is any performance impact. To be able to prevent some posts from appearing on home page (or RSS feed, etc.) this query needs to be modified. 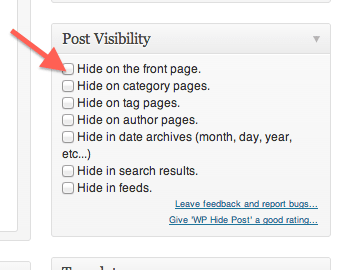 WP hide post plugin is a good plugin which let you achieve these functionalities. Here is how the wordpress post edit admin UI looks like when plugin is instaled and activated. The plugin was last updated on 2010-1-3. So I was initially little worried about using it. But it is pretty simple and worked nicely. Moreover its a good idea to understand how plugin is doing it so that one can fix things if needed. The plugin adds a filter to posts_join_pages which adds a join clause in query to get posts from wp_posts table (on wp_post_options). Note that this will add little overhead to query in terms of performance. Also post will still apear in sitemap and other browse pages. Since the query to get posts is on two tables, there will be some (very little if number of posts are not too many) performance impact. If your blog posts are under 10000 or so and you are using some caching plugin like W3 total cache, then the impact can be pretty much neglected for all practical purpose. In case you are obsessed about performance, then you may want to explore adding a filter to posts_where_pages and excluding the post ids which are in php code itself. You may have to auto generate that part of php code using some automated script and your own workflow. This approach may be harder to maintain and not recommended. But I think its good to be aware of all feasible options.